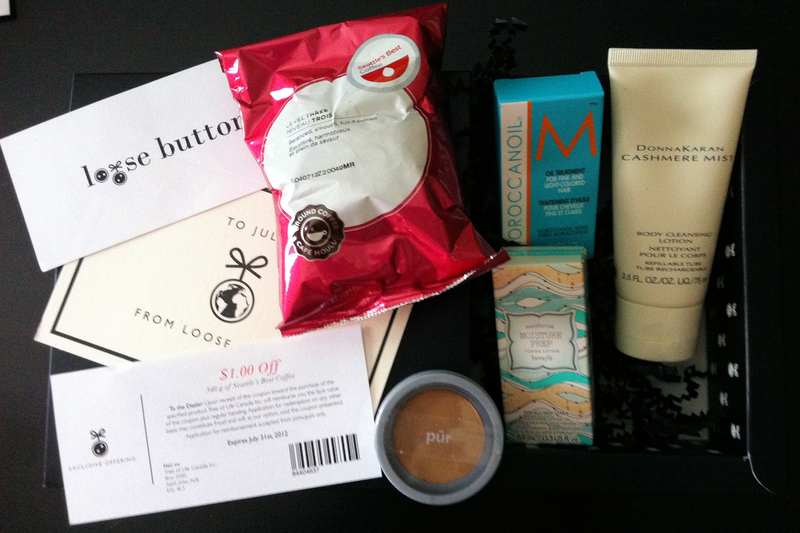 You Are Here Home » Review & Giveaway » Beauty & Fashion » Would You Like a Luxe Box? Would You Like a Luxe Box? Today a surprise came for me in the mail, it was my beloved Luxe Box by Loose Button! I’ve written reviews about their products over the past few months and am happy to be doing another review and giveaway of these special packages. If you sign up, you will receive a package monthly with 5-6 deluxe beauty samples which allow you to sample high-end products before making a pricey purchase. As always my package was personalized and was beautifully wrapped, Loose Button also surprised me with a second box, the Bath and Body Box! Fekkai Advanced Brilliant Glossing Shampoo and Conditioner: The glossing shampoo and conditioner that everyone has been raving about! I received: 0.3 fl. oz. Pur minerals – 4-in-1 Foundation – Skip the mess and go pressed with this award-winning foundation, powder, concealer and SPF15. Retail Price: $31(8g). Once again it’s a great Luxe Box, Pur Minerals is one of my favorite foundations and I was quite excited to receive it. All of the other items were a treat, however I have no use at all for the Light Moroccanoil but I’m certain someone will love receiving it as a gift from me. How would you like to receive one Luxe Box in the mail? One lucky Canadian reader will win, entry is simple…just fill in the Rafflecopter form below. I like trying new products and receiving them is like a present in the mail. I’d love to get a box and try out new products! I’d love to win so I can try some new products. I love trying sample sizes before purchasing the full sized product. I love trying new beauty brands and tools. I also love surprises! I would love to try some new cosmetics. I would love to check one of these out. Seen so many great reviews lately. Not sure if I would have a use for or keep all of the products, but I’m certain I could make my mom a very happy lady with whaatever I didn’t want. Love to win this for my wife as she loves healthy and beauty stuff. I LOVE this concept and beauty products haha. I’m just a little nervous to commit- eep! I’d like to win a Luxe Box because I like the sizes of the products. It’s a great way to find out if you like a product without a huge outlay of cash and also there is less wasted if a product is not to your liking. 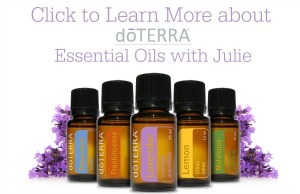 I would love to try the new products as well. I like to try products before I buy them so this sounds like a great way to save moneyand get the right products for my skin. Since I have basically been confined to the house in the past year it’s hard for me to shop for cosmetics and personal products, so this would be awesome and they have great brands. I would love to try a LUXE box so I could try out great new samples before I decide to buy them! I would like one, because I can’t sign up to get these myself since I have no credit card and they don’t take paypal . I love beauty products and the Luxe Box would be perfect for me to try and test samples before buying what I like in full size. I’m not much of a beauty product connoisseur, so I’d love to try something beyond Cover Girl. I love trying out new products. And getting a surprise in the mail these days is wonderful! I’d love to get a surprise in the mail, and they work with really great brands! I would love to win a luxe box because I am wanting to get back into a beauty routine, and have no idea what products to try. Sounds like it may be a great way to test things out! I’d love to win a Luxe Box because I love experimenting with different beauty products and getting a box to play with every month would be super fun! I would love to win this because I have never tried a Luxe Box before and I do love surprises! I would love to try some new products! Great giveaway. I always like tomtry new products. I love trying products before I purchase them. I think this is a fun giveaway, and the winner will be very excited to receive this box. 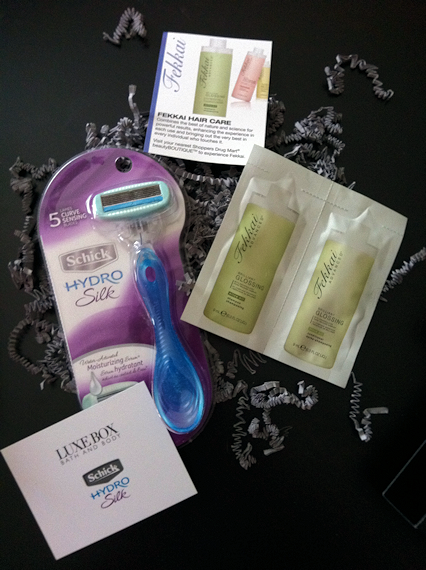 i get so happy when i receive samples or any package in the mail… and i just loooooovvee trying new products!1! This is the first I’ve heard of Lux Box. I always love trying samples and would love to win one. I wanna win because getting mail is awesome! I really like the idea behind beauty boxes :) I would love to win the Luxe Box because I love surprises and one with beauty products makes it even better! I’d like to win a Luxe Box because I love trying new products that I otherwise wouldn’t try because of the price. I don’t want to spend a lot of money to buy something and end up not liking it. I would like to win to see what you receive since I like surprises and trying new things. I am always interested in trying new cosmetics and would like to try the Luxe box. I would like to win because it would be fun to have a surprise come in the mail. I’ve been dying to win one! I think they are fantastic and would love to receive that gorgeous box full of surprises! I’d love to win because I hate spending $ for full size products that I’ve never tried and not really liking them. I’d love to win b/c it’s much more fun to get a treat in the mail than bills. I’d love to win the Luxe box, hard to find products that work for your body/skin type. Plus variety is the spice of life. Because you never know what is in it – totally makes you feel so special everytime you open it. I’d love to win a Luxe Box because its always nice to try before you buy! I like to try new products that I most likely would never try.. I think it would be fun to send to my sister! i love getting new makeup and other products to try! I would love to win a luxe box because I think it is cool to get surprises in the mail and to try out new products. Thanks for the chance. I would love to win! Would be so fun to try out new products!